Spectacular Views From The Top! There are breathtaking views of the mountains and canyons below as you hike along the trail. Warning: Do not attempt this hike unless you are in good physical condition. It is a 2.4 mile climb up a mountain, then all downhill on the return. Expect to go about 1.5 mph. Remember, this hike is at about 1 mile in elevation, so the air may be a little thinner than you are used to. Let’s get to the point. 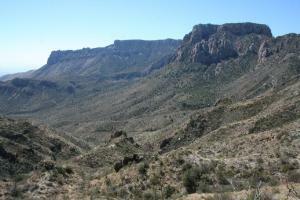 Big Bend National Park is a hiker’s paradise. I drove over 600 miles to visit this park, but it was well worth it. This park is spectacular and grandiose. It reminds me of a cross between Yosemite and Death Valley. In Texas, as far as I am concerned, Big Bend National Park is the mack daddy park and it’s trails make all other state and local park trails pale by comparison. This park is a MUST SEE! The Lost Mine Trail is a beautiful hike. It is not a flat trail, but a hike up a series of mountain sides. The trail is extremely well-maintained and there are plenty of rest stops. There are a number of breathtaking vistas on the way up and they keep getting better and better as you increase in altitude. There are a lot of switchbacks as the trail climbs approximately 1,100 feet, so it will have you breathing hard. I recommend a walking stick to help with the climb and to keep your balance, especially in the rocky areas. At the top, you are afforded absolutely tremendous views of the area and down into Mexico. Many hikers relax and hang out at the summit since it is so beautiful. I highly recommend this hike.